Adrenal gland, Cortex - Angiectasis in a male F344/N rat from a chronic study. There are widely dilated, blood-filled vascular channels (A) in the cortex of the adrenal gland. 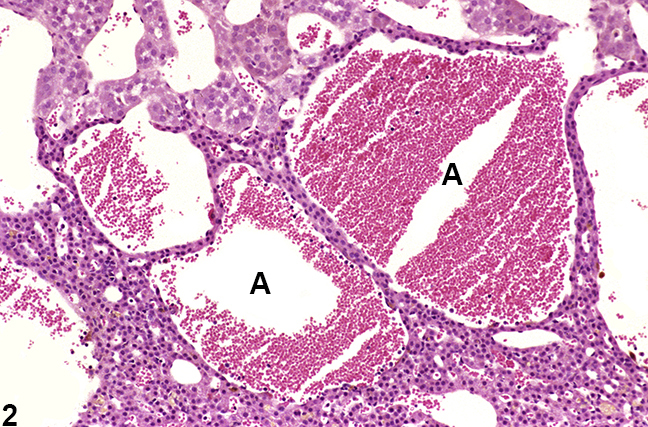 Adrenal gland, Cortex - Angiectasis in a male F344/N rat from a chronic study (higher magnification of Figure 1). The widely dilated vascular channels (A) cause slight compression of adjacent tissue. Angiectasis ( Figure 1 and Figure 2 ) in the adrenal cortex and medulla of rats and mice is characterized by focal to diffuse dilation of blood vessels (capillaries and/or veins). The dilated vessels are loosely to irregularly arranged and do not form discrete masses. They are lined by single layers of well-differentiated endothelial cells supported by a delicate fibrous stroma and contain variable amounts of blood. Angiectasis can be associated with or secondary to other adrenal lesions such as inflammation, atrophy, degeneration, and neoplasia. It can also occur as a spontaneous age-related change in old rats and mice. Angiectasis and hemangioma can be difficult to differentiate, but a distinction should be attempted. Hemangiomas tend to be well-circumscribed, unencapsulated masses composed of densely packed, dilated vascular spaces. The vascular spaces are lined by a single layer of normal-appearing endothelial cells aligned on usually delicate collagenous septa, though some cases exhibit more abundant collagenous stroma. 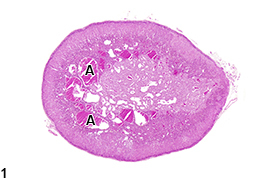 In contrast, although angiectasis is also characterized by dilated vascular channels lined by unremarkable endothelium, the vascular channels are more loosely or irregularly arranged rather than presenting as a well-demarcated mass. Adrenal angiectasis should be diagnosed and assigned a severity grade. A site modifier (i.e., cortex or medulla) should be included in the diagnosis to indicate the location of the lesion. If it is present in both the cortex and medulla, the site modifier may be omitted and the location described in the pathology narrative. 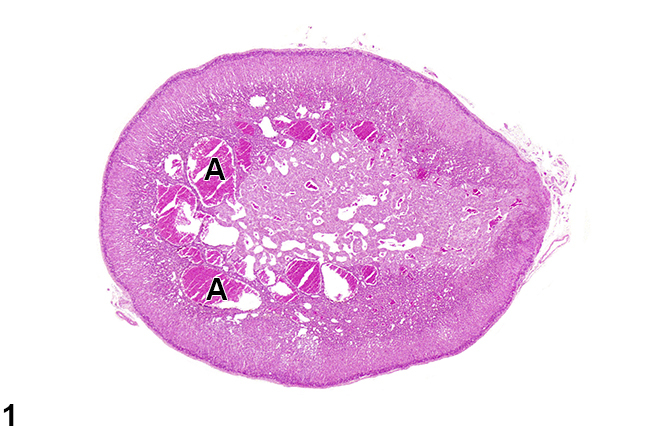 If angiectasis is considered a component of or secondary to other lesions (e.g., cystic degeneration, inflammation, or neoplasia), it should not be diagnosed separately but should be described in the pathology narrative. If angiectasis is seen in both adrenal glands, the modifier "bilateral" should be added to the diagnosis (lesions are assumed to be unilateral unless otherwise indicated). McInnes EF. 2011. Wistar and Sprague Dawley rats. In: Background Lesions in Laboratory Animals: A Color Atlas (McInnes EF, ed). Saunders Elsevier, Amsterdam, 16-36. National Toxicology Program. 1996. NTP TR-455. Toxicology and Carcinogenesis Studies of Codeine (CAS No. 76-57-3) in F344 Rats and B6C3F1 Mice (Feed Studies). NTP, Research Triangle Park, NC.